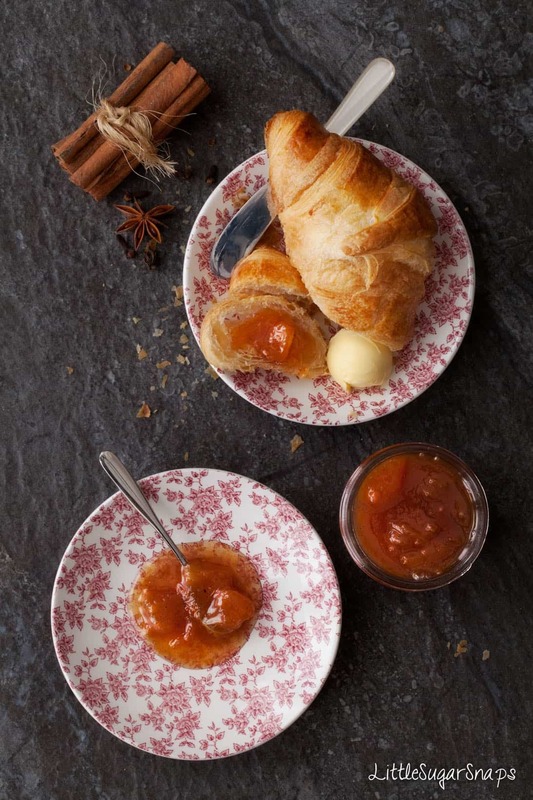 Full of summer colour and flavour with a kick of sweet spice, this Spiced Peach Jam tastes good all year round. Make a batch up and enjoy it through all of the seasons. I’m excited. You see, now that summer is here it’s time for me to start thinking about the jams I’ll be making to stash away in my pantry for the year ahead. I count myself as lucky since I live just 5 minutes away from a Pick Your Own farm and I have 2 very willing helpers to assist with gathering the fruit. Our firm favourites are always blackcurrant and cherry jam. We always end up with a few random flavours added to the variety, reflecting the whim that takes our fancy that summer. But the bounty of sweet, fruity jars that will land on my shelves this year is set to be the best so far since we are growing our own blackcurrants. Being honest, I’m expecting to get just one jar of completely homegrown, homemade blackcurrant jam. I’m expecting it to last a whole two days before we, as a family, have devoured the entire pot and and scraped it clean. But it will be oh so good. And homegrown. Excuse my sidetrack, today is meant to be all about Spiced Peach Jam – my flight of fancy from summer 2016. Jam making, as you can probably tell, is a summer ritual I am slightly addicted to. I just love creating a seemingly endless supply of homemade summer flavour for my family to enjoy all year long. Having got a handle on the basics of jam making over a number of years, last year I got experimental. What evolved was this deeply colourful, sweet and gently spiced, pot of peachiness. Spread this Spiced Peach Jam onto your morning toast. Dollop it on your flaky croissants. Spread it between layers of Victoria Sponge Cake. I don’t need to tell you how to use jam. do I need jam sugar? or should I be using preserving sugar? and when, exactly, do I need to add pectin? then head over to Serious Eats for a low down on the science behind fruit, acid, sugar, water and pectin. So here’s to my ongoing consumption of Spiced Peach Jam 2016 and the 2017 batch of jam about to emerge. The setting point for jam is 105c (220F) - use a sugar thermometer or a Thermapen to check the temperature. You can also check for the setting point using the "wrinkle" test. Before you start making the jam put a couple of small heatproof plates in the freezer. Once your jam has boiled for several minutes, take the pan off the heat and spoon a blob of jam onto one of the cold plates. Let it stand for a minute then push the jam with your finger. If the surface wrinkles then it has set. If it is still quite liquid then put the pan back on the heat and boil the jam for another 3 to 5 minutes before testing again. Peaches scream summer to me, so much a part of my growing up. Love the look of your jam and will keep it in mind when summer rolls around again in the Southern Hemisphere. It won’t be long – we are almost at Mid-Summer’s Day! This looks fantastic! I love homemade jam, but have never made peach before. I just have to make this soon as I can imagine spreading it on everything; so delicious! Pretty much – once opened it doesn’t last long. Thanks Annie. This looks so delicious, gorgeous photos! You forgot to mention, eat it by spoonfuls coz I am pretty sure that’s what I will be doing. That color and those pictures Jane!! Brilliant stuff. Ah, thankyou S. It was quite hard to stop eating it. My reserve is going down rapidly. I need to make more asap. Thankyou Kellie. Seems your six jars is just about right. Maybe squeeze in a 7th for this year though, just to be sure. I was JUST telling my husband that we needed to make some jam for M’s morning toast and bam- here it is!! Hooray for fresh peach season – adding this to the top of my list to make! Thankyou Tracy. One of my daughters loves peachesso much that she eats them as fast as I can buy them when in season. She has a particular soft spot for this jam, so I hope your little M does too. My mum’s peach jam is legendary but this looks even better! In fact it looks phenomenal. I think you need to make a peach cake with it! Um, don’t tell you Mum what you just said and as for peach cake – genius. Thanks Lucy. 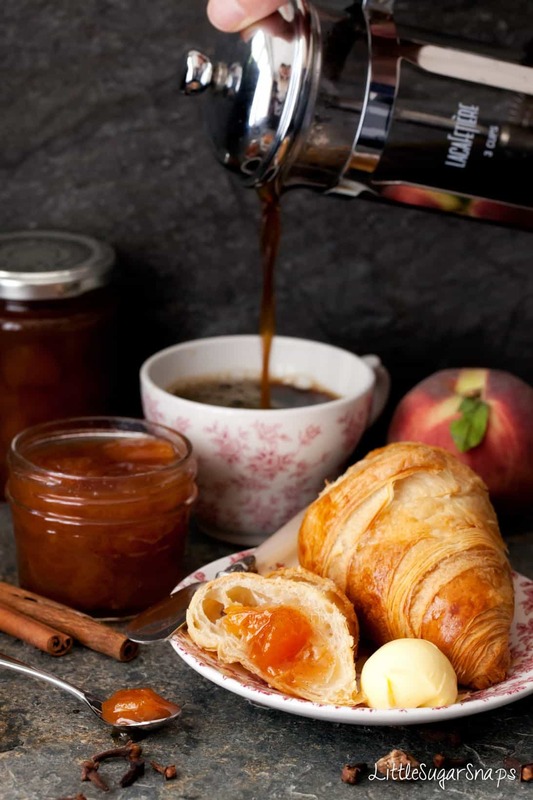 This sounds so delicious, particularly with all the spices; I love making jam but for some reason have never made a peach one; one to make this Summer perhaps! Thanks Hannah. I need to make more, it doesn’t last long once opened in my house. 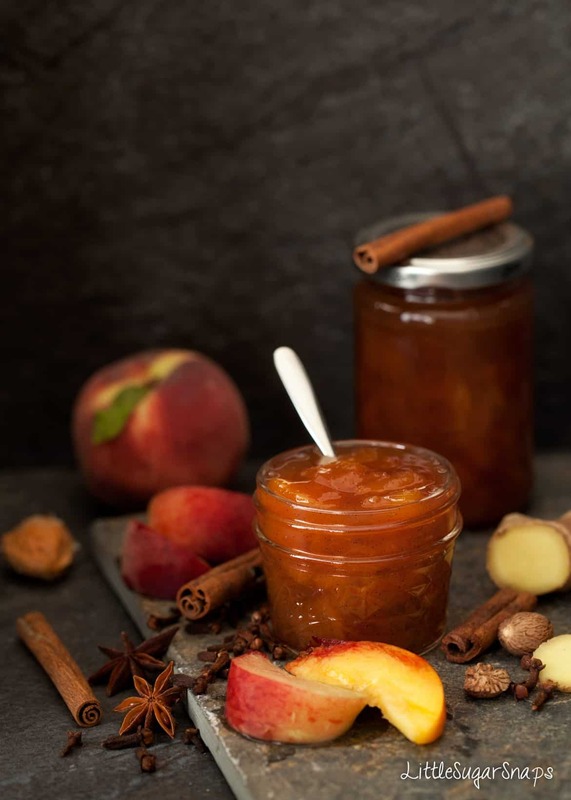 I have never made spiced peach jam, and this recipe was delicious! Thank you for sharing it! Oh Lisa, thank you so much for taking the time to let me know you enjoyed it – you’ve made my day.